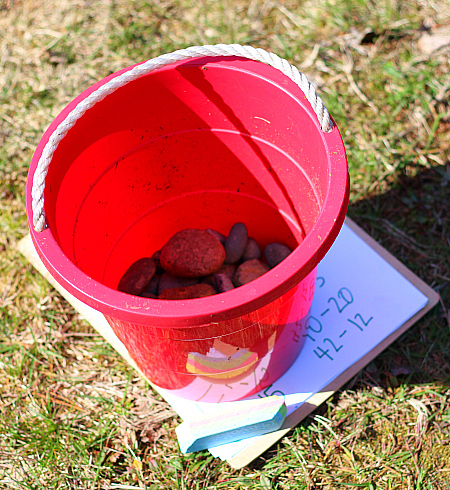 It’s spring and it’s time to get outside and learn! 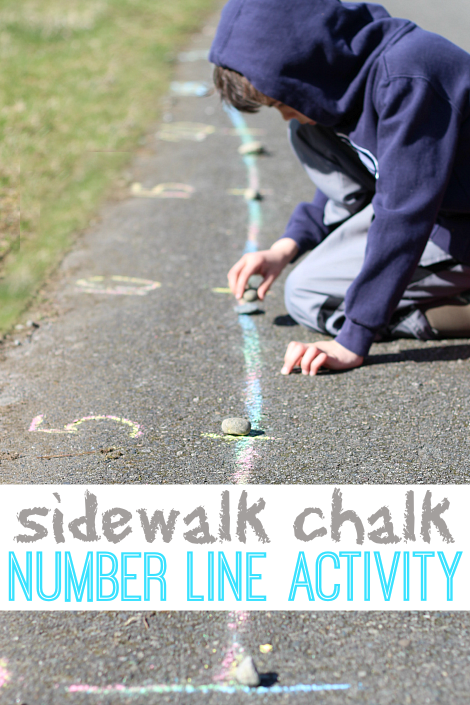 This sidewalk chalk number line activity is great because it uses almost no materials and you can use it however your child needs to. My son used the line as a place to show his answers but didn’t use it as a manipulative itself, and my daughter used it to count by 5 with help. 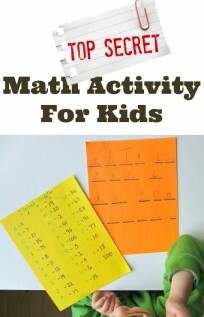 Your child may like the line as a guide to figure out the equations or as a way to show their answers to mental math like my son. Use it for whatever math goal you are working on. Gather your materials. 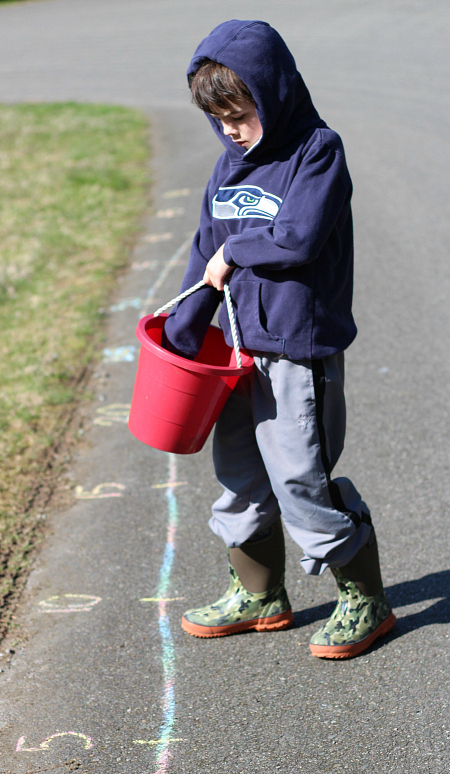 You will need a sidewalk or road, sidewalk chalk, some pebbles to use as place markers and a young mathematician or two. 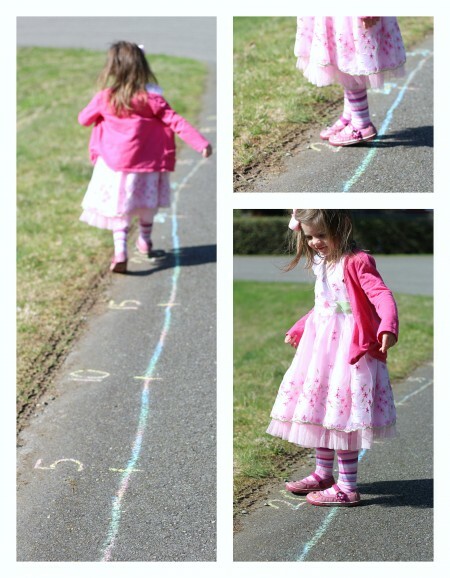 Start by drawing a number line on the ground. Ours went from 0-50 by 5’s and I used one big step to measure between the numbers. 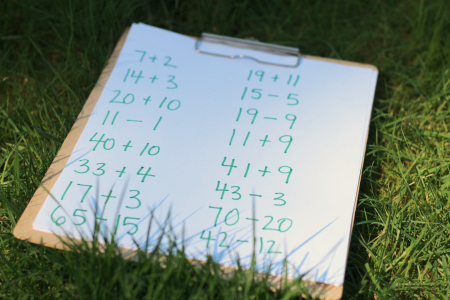 Ours did not have marks to mark each number on the line but if you want to you can do this. I had my son estimate where those numbers would be when he needed to. My line is a little wobbly but it didn’t bother either one of my kids or change the outcome. Don’t stress about little things like this. I wrote out equations that my son has been working on doing mentally. This is our way of drilling without drilling. 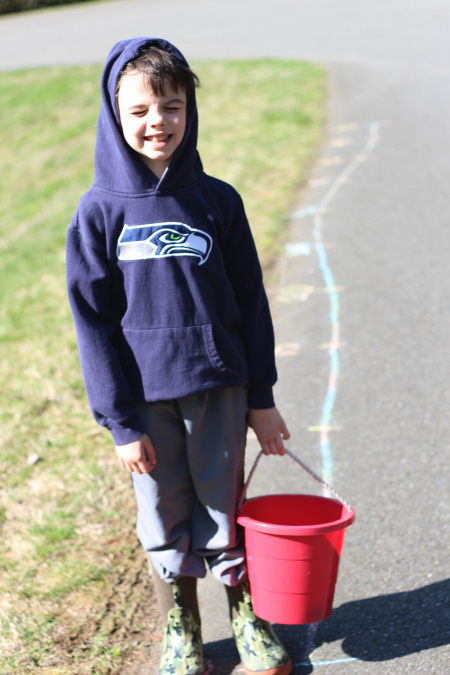 It’s fun and active and even if you are working on drills you can add an active element. 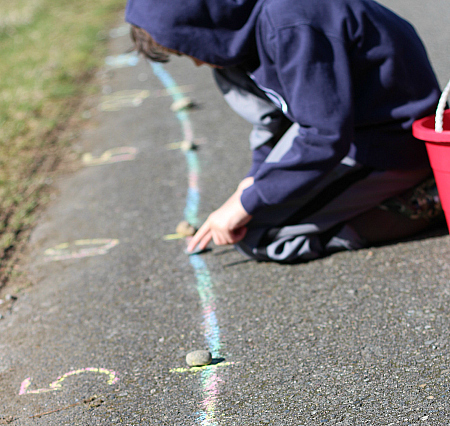 Then switch gears to using the number line as a tool to help figure out the equations. Call out the equation and have them place a pebble on the answer. Keep going. 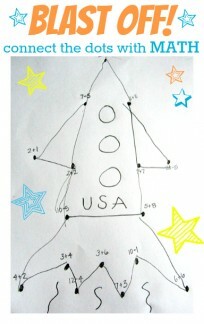 This was a big hit with my son and I went through all the equations and added more on the fly. For younger players have them simply find the number and step on it. 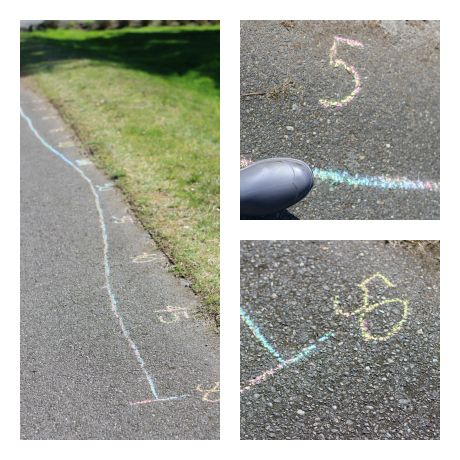 For my daughter after she walked the line and counted by 5s I called out the numbers on either end of the line so she was bopping from one end to the other and learning as she went. 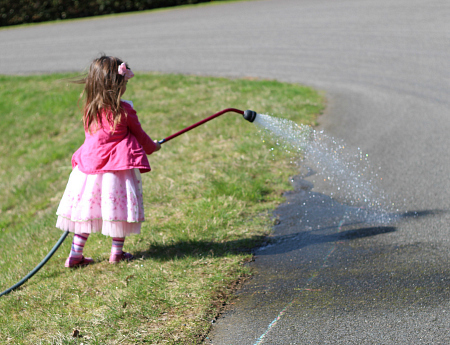 Although it often rains around here we aren’t expecting rain for a few days so we grabbed the hose and sprayed down our line when we were done. 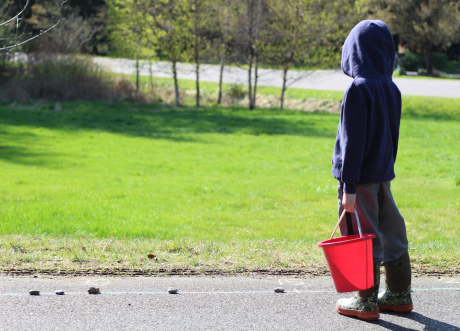 Want more active learning ideas for kids? 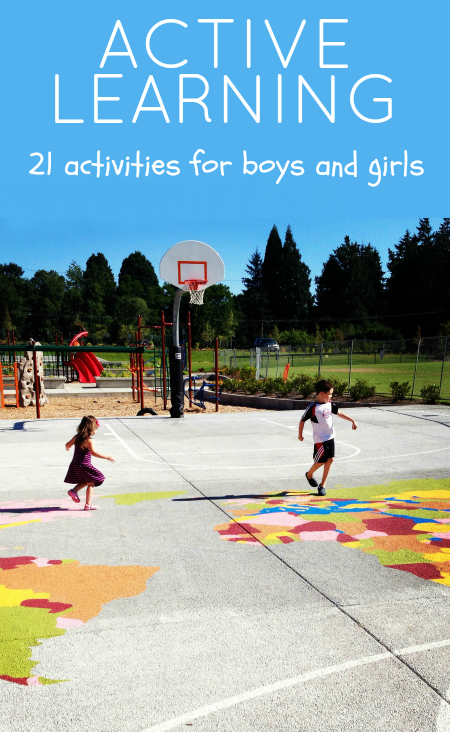 Check out these 21 fun ideas! 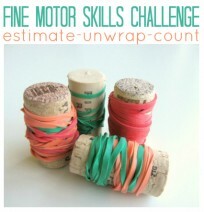 Great idea – I’m going to try this with my special ed preschoolers. And, I LOVE your boy’s sweatshirt. Go Hawks!